Ford of Canada President Mark Buzzell says despite a focus on mobility, the company won't stray from its core business. 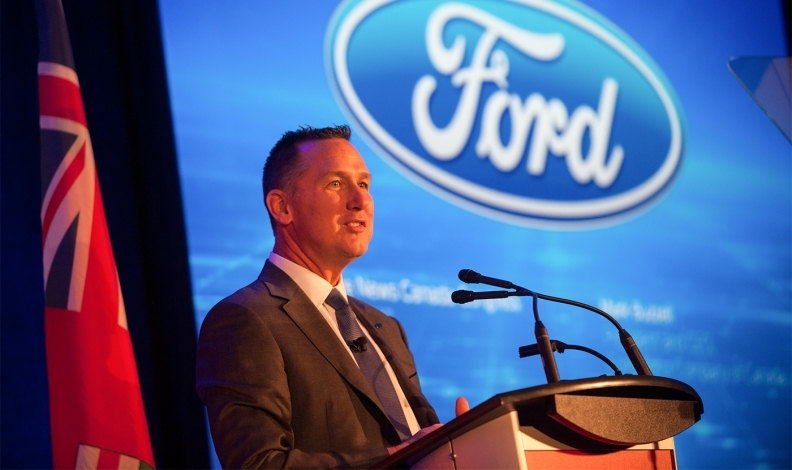 Ford of Canada President Mark Buzzell thinks Canadians can help shape a safer, greener — and more profitable — company. Buzzell told a soldout audience at the first Automotive News Canada Congress in Toronto on Feb. 17 that Ford expects to reap 20-per-cent profit margins from emerging divisions like Smart Mobility, Ford GoBikes, Chariot shuttle service and Ford CarrE, a high-tech hoverboard of sorts that drivers can carry in their trunks. “We’re expanding our business model to be an automotive and mobility company,” Buzzell said. Canada’s leadership in fields like robotics and artificial intelligence are ways the country could play a role in helping develop technology for the automaker, he said. After all, University of Toronto emeritus professor of computer science Geoffrey Hinton is considered one of the founding fathers of deep learning and artificial intelligence, Buzzell noted. “I do think there are opportunities to explore these technologies and solutions in parts of Canada,” he said. For example, after being named to his new position, Buzzell moved to Oakville, Ont., and immediately noticed problems urban congestion causes in the Greater Toronto Area. Gridlock and pollution are at the centre of Ford’s mobility work, the company says. The Ford City Solutions team is designed to directly work with some of the world’s largest cities to identify the needs of their citizens and tailor transportation solutions for them. Those solutions could include dynamic shuttles, autonomous vehicles, ride-hailing services, bike sharing or all of the above. “What role will we play in Canada?” Buzzell asked, suggesting Toronto may one day be one of the cities the Ford City Solutions team works with. Ford is determined to be a leader in mobility, autonomy, electric vehicles and safety, he said. At the same time, Ford “will continue to invest in our core business,” including manufacturing, sales and financing, Buzzell said. But the company is aggressively pursuing new avenues, he said. Ford Motor Co. as a whole will invest US $4.5 billion (CDN $5.9 billion) in electric vehicle development over the next five years and unveil 13 new EVs by 2020. It will also introduce two hybrid police vehicles during that time and plans to have fully autonomous vehicles available by 2021. The company is already working on a vehicle-charging pilot project that allows a vehicle to recharge over a wireless power pad. Ford is also trying to reduce its use of drinkable water at its factories to zero. And it’s Oakville facility became the company’s first North American assembly plant to send zero waste to landfill. “We believe great companies exist first foremost to serve society,” Buzzell said.